BILLINGS, MT -- The death of a tourist who left a boardwalk and fell into a boiling, acidic spring in Yellowstone National Park offers a sobering reminder that visitors need to follow the rules, park officials and observers said. No significant human remains were left to recover after Colin Nathaniel Scott, a former nature preserve volunteer from Portland, Oregon, went off a designated pathway and slipped on some gravel and into the water in a geyser basin dotted with boiling hot springs, authorities said. Only his sister witnessed the fall, park officials said. The pair had walked about 225 yards off the boardwalk to get closer to some thermal features, which is against park regulations, officials said. It follows a string of incidents that have raised questions about tourist behavior at the nation's first national park, where visitor numbers are surging. That includes people getting too close to wildlife and entering dangerous areas in violation of regulations. Scott graduated from Pacific University and previously worked at the Jackson Bottom Wetlands Preserve in Oregon, said Mary Loftin, a manager at the Hillsboro, Oregon, parks and recreation department. Scott worked there for about 20 months fielding questions from visitors, and his stint ended last year, she said. "A very nice young man; a bright spirit," Loftin said. 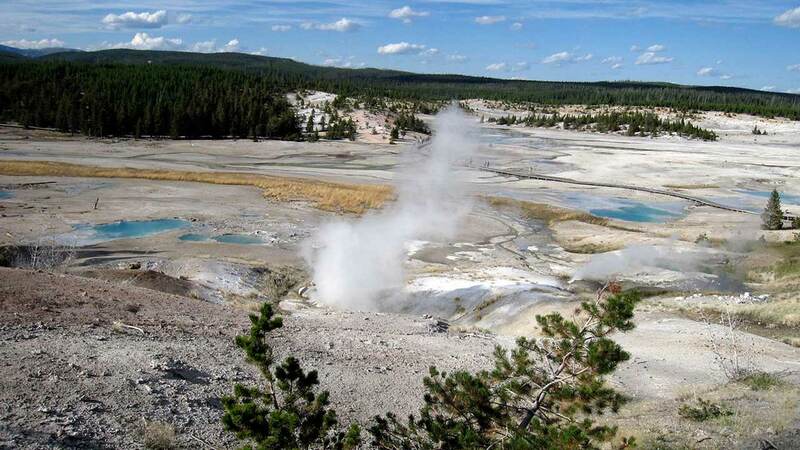 After Scott's sister reported the fall, rangers navigated over the highly fragile crust of Norris Geyser Basin to try to recover his body. They halted the effort "due to the extreme nature and futility of it all," park spokeswoman Charissa Reid said. Only some personal possessions were recovered. His death occurred in one of the hottest and most volatile areas of Yellowstone, where boiling water flows just beneath a thin rock crust. Visitors must keep to designated boardwalks when moving among the park's hot springs and geysers that blast steaming water high into the air, Yellowstone Superintendent Dan Wenk said. He said the tragedy was a reminder to follow park rules. "It's sort of dumb, if I could be so blunt, to walk off the boardwalks not knowing what you're doing," said Kenneth Sims, a University of Wyoming geology professor and member of the Yellowstone Volcano Observatory. Sims said he was speaking generally and had no direct knowledge of the circumstances of Scott's death. Norris Geyser Basin is a popular attraction in the nation's first national park, which received a record 4.1 million visitors last year. Water temperatures there can reach 199 degrees, the boiling point for water at the park's high elevation. Most of the deaths have been accidents, although at least two people had been trying to swim in a hot spring, according to park historian Lee Whittlesey, author of the book "Death in Yellowstone." The crust that makes up the ground in parts of Yellowstone is formed when minerals underground are dissolved by the high-temperature water, then redeposited on or near the surface. That crust can be as "thin as a skiff of ice" Reid said. Other recent tourist incidents at Yellowstone include a 13-year-old boy who got burned Saturday when his father, who had been carrying him, slipped into a different hot spring.